We’re a few weeks into the year… how are you doing with your New Year’s goals/resolutions? Goal setting is the best way to transform lofty resolutions into bottom-line results. 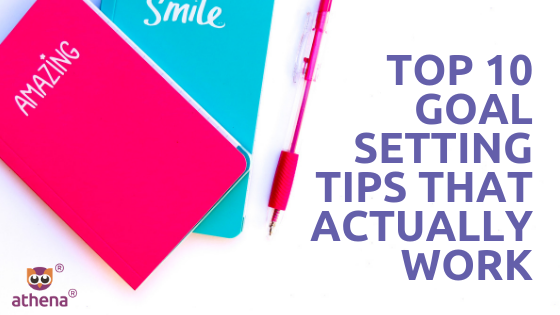 So, we want to share with you my top 10 SMART goal setting tips that work. # 1. Record your goals and action plans on paper. Whether you write them down or type them, the very act of recording them will help you flesh out your ideas. Once your plans are complete, you’ll have a detailed roadmap with directions to follow. # 2. Review your goals and plans regularly. Make a monthly, if not weekly review. This will help keep you on track as time unfolds. # 3. Push yourself without being ridiculous. Choose goals that excite you and make you stretch — but also are within reach. Focus on attainable goals that you can realistically reach within the year. You want to create a habit of being victorious in accomplishing your goals. # 4. Set an action plan for your goal. Write down exactly what you’re going to need to do in order to achieve the goal. # 5. Go for quality, not for quantity. Better to have three or four solid goals than a long wish list you’ll never get through. You can always add more goals later once you’ve accomplished the most important ones. # 7. Set deadlines along the way. A timeline for completing steps towards a goal gives you an action plan. If you have one big goal, try breaking it down into smaller pieces and setting shorter term goals that will ultimately lead up to you accomplishing the big one. # 8. Share your goals with others. These “witnesses” can help hold you accountable. The law of commitment says that we have a natural tendency to want to remain committed to accomplishing what we’ve told other people we’re going to do. This “pressure” will increase the chances you’ll do what’s necessary to accomplish your goal. # 9. Tape your goals to your bathroom mirror (or some place else where they will be highly visible). They won’t do you any good if you stick them in a drawer and forget about them. You want to maintain top of mind awareness. What’s not on the top of your mind, get’s forgotten. # 10. Stay flexible. The unexpected may force you to revise, recalibrate or scale back. That’s okay as long as you’re still moving forward. These should be addressed in your monthly check in with yourself.